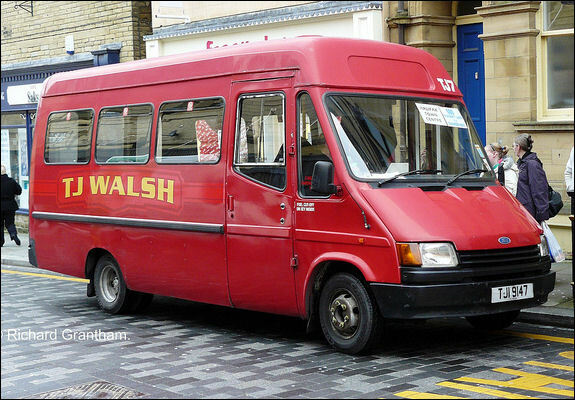 1983 – TJ Walsh Minibus Services was started, with one minibus providing contract hire services in the local area. 26th October 1986 – As a result of deregulation of bus services all PTEs were compelled to transfer their bus operations to “arms length” public transport companies. 1987 – First public minibus service was started, which ran from West Vale to Denholme via Illingworth. Early 1994 – TJ Walsh surveyed what was lacking with the bus services in Halifax and realised there was a market for a bus service for shoppers, which ran straight in and out of the town centre and not the bus station. 30th June 1994 – The first public bus route for TJ Walsh was started, the 525 service which runs from Halifax to Ovenden Way. TJ Walsh’s first bus was ‘TJ1 9147’. TJ1 was a 16 seater Transit Minibus. This service ran from 08:30 to 11:30 every 20 minutes. This service is still run by TJ Walsh today (but not with the same bus!). 19th September 1994 – A second bus service was started, the 555 service from Halifax to Siddal. This route ran in the afternoons and used the same bus as the 525 service which ran in the morning. 9th September 1995 – An additional 16 seater Transit was purchased. This ran the 600 service, the Nursery Lane circular. The 525 and 600 services ran every 10 minutes, 08:30 to 14:25 Monday to Friday and 08:30 to 13:00 on a Saturday. 13th April 1999 –The 700 service was started.